Leona Edmiston use Borderfree to process international orders. You will be quoted a specific delivery promise at the time of checkout that is based on your selected destination country and the shipping methods available for the items in your shopping cart. Duties (or Customs tariffs) are set by the destination country Customs authorities and determined based on a combination of the country of origin (manufacturing) of the goods being purchased and the classification of that merchandise in accordance with a harmonized system adopted and used by the countries that Borderfree supports. International taxes (such as Value Added Tax, or VAT) are set by the destination country. You will be able to view the total amount of applicable duty and tax/VAT for your order within the Borderfree international checkout. At checkout, you may be presented with options to either prepay duties and taxes or to pay duties and taxes on delivery. If you choose to prepay duties and taxes, the order total presented at checkout is the exact amount you’ll be billed by Borderfree, and there will be no additional costs due upon delivery. If you choose to pay duties and taxes on delivery, you will be required to pay these fees to the shipping carrier when you receive the order. Try your online purchases on in the comfort of your own home and if you need to return them, you have 21 days from the date of shipment to do so. Once this tag has been removed, the garment is no longer returnable. We do not accept returns, exchange or Leona credit on final clearance purchases, as advertised; unless the item is deemed faulty, whereby the Faulty Returns Policy will apply. The above policy only applies to the Leona Edmiston Online Store. 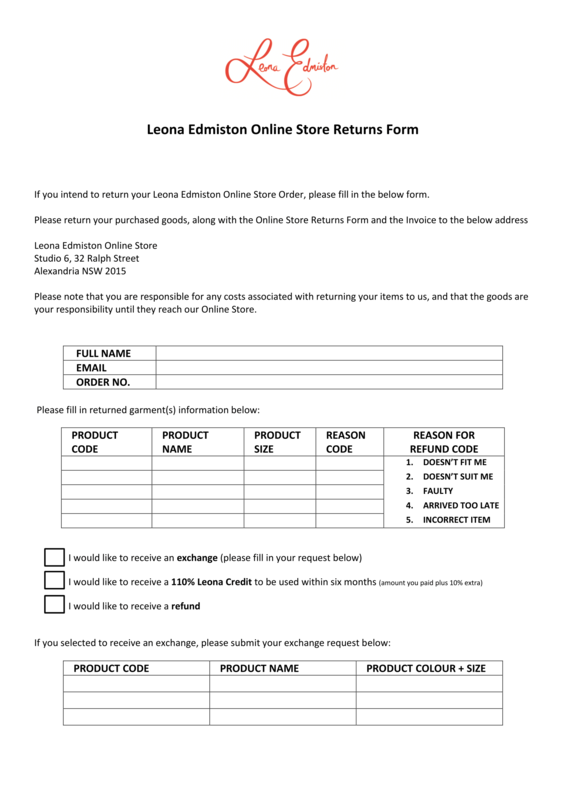 Leona Edmiston stores are unable to accept returns on items purchased online, and in turn purchases made in-store cannot be returned to the Online Store. All deliveries comes with an Online Store Returns Form, see reverse side. Alternatively, you can download this form from our website. Click here to download a return form This must be completed and sent to us with your return. Please note that you are responsible for any costs associated with returning your items to us, and that the goods are your responsibility until they reach our Online Store. Upon receipt of the return, we will notify you of its arrival along with the status of the return. The above policy only applies to the Leona Edmiston Online Store. Leona Edmiston stores are unable to accept returns on items purchased online, and in turn purchases made in-store cannot be returned to the Online Store.For purchased made in Leona Edmiston stores, no refunds are available unless required by law. Returns, other than for faulty items, must be made within 14 days for either credit note or exchange, with proof of purchase. Returned items must be in original condition and must not have been worn, altered or washed. All tags must remain in place. Every garment sold has a tag attached reading “Please note that returns will only be accepted if this tag remains attached and garment is in unused condition”. Once this tag has been removed, the garment is no longer returnable. Please note we are unable to exchange or refund for Pins due to hygiene; unless faulty. Please note, for all refunds, Leona Edmiston will process using the original tender type. Debit and credit card returns must be processed against the exact card used to complete the original purchase.